Magic Mountain Farm produce s about 5,000 pounds of food per acre; a wide variety of herbs, fruits, nuts, coffee, greens, and of course chicken eggs. We are organic, with as healthy of a balance as we can create with weeds, vines, insects, and so on. We fertilize with natural products and avoid toxic chemicals. Everything is not laid out in neat rows. Not every square inch is planted with crops. So although we are proud of how much good food we produce, we could actually grow a great deal more, if we went all out. And although we might get bored with what is available seasonally, I doubt we would starve, if we had to rely on what we produce on the farm. Yet, the state of Hawaii is very dependent on food imports. According to a recent article (see LINK below…), there is only about a three day food supply on our islands at any given time. Interestingly, before European contact, and the diseases that came with it that decimated the native Hawaiian population, it is estimated that on the Big Island of Hawaii, where we live, there were nearly twice as many people, and of course they had to rely entirely on what could be grown and raised here, for food! Rain forest near Hilo. c. 2015 S.A. Jones. The Big Island has every climate in the world, except arctic. From snow-capped summits, to tropical rain forests, we have it all. The link below is to a wonderful story that recently appeared in the New York Times about a visitor’s discovery of the amazing variables we experience everyday here. 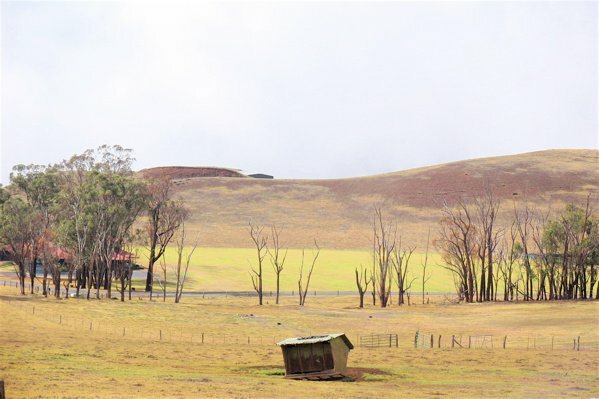 Ranch land along the Saddle Road. c. 2015 S.A. Jones. Cattle grazing near Wiamea. c. 2015 S.A. Jones. 7,000′ elevation, with Mauna Kea’s peak looming up in the clouds. c. 2015 S.A. Jones. 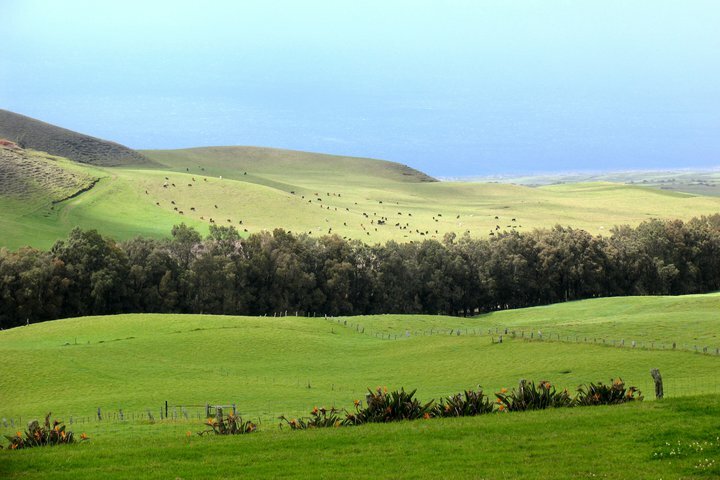 by ranchers, paniolos (Hawaiian for cowboys), and the best chefs in the state. 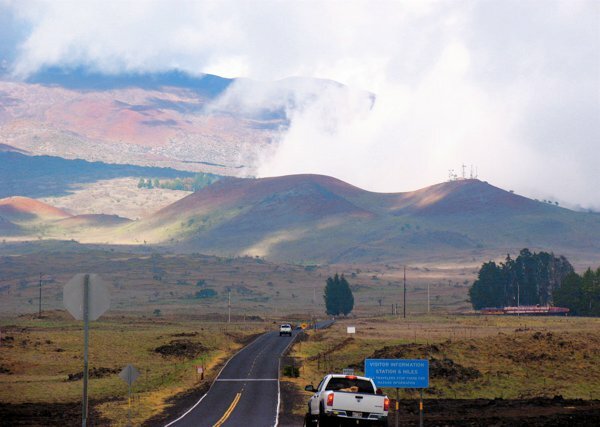 From the cloud-forested coffee lands, to cowboy country, from the beaches to lava-scapes, from freezing temperatures to sweltering heat, the Big Island truly, nearly, has it all! 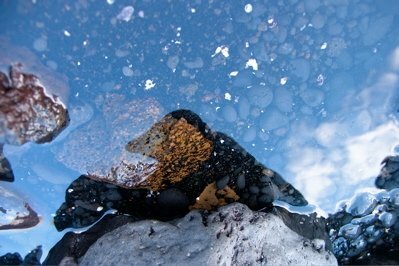 Reflections at a black sand beach. c. 2015 S.A. Jones. There are many varieties of ginger growing on Magic Mountain Farm. The roots of one type of ginger can be used to make tea or a ‘broth’ for soups, cooking rice, and making hot cereal. Ginger is known as an anti-inflamatory and tummy soother. 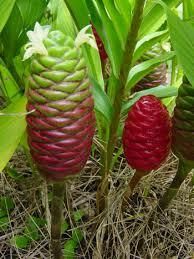 Other types of ginger produce yellow and while flowers, with wonderful fragrances. 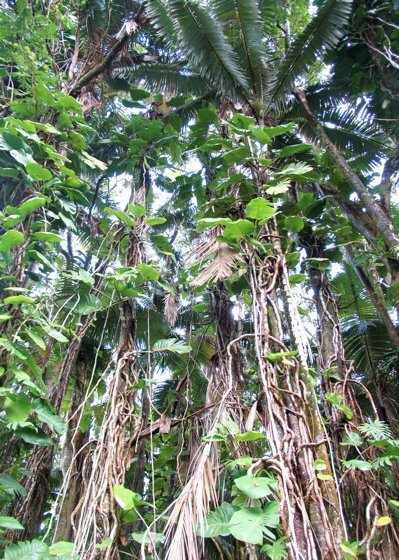 Awapuhi ginger (pictured, left) was used as soap by ancient Hawaiian people. It is used in commercial cosmetic products today, especially shampoos. Farm visitors enjoy awapuhi for its beauty and have been known to squeeze the ‘bulbs’ in water to release a refreshing, cleansing lather. Rose hips are the round portion of the rose flower just below the petals. 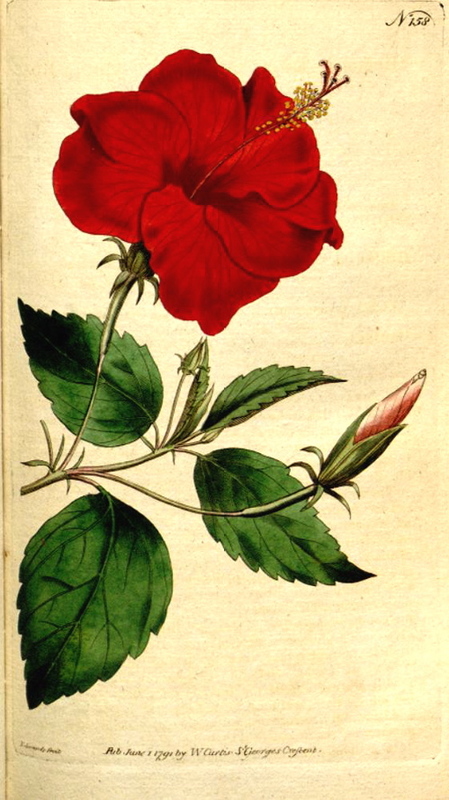 Rose hips contain the seeds of the rose plant. Dried rose hips and the seeds are used together to make medicine. 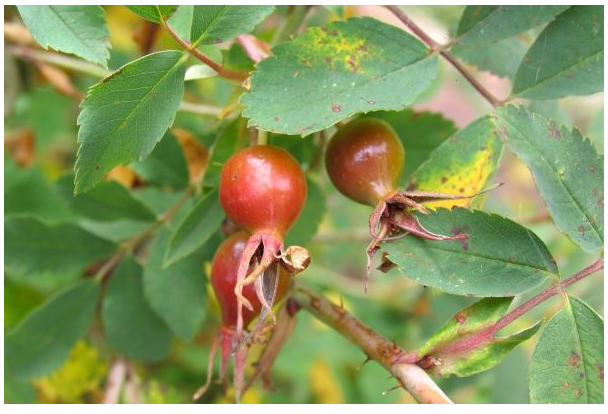 Rose hips are also used for stomach disorders including stomach spasms, stomach acid deficiency, preventing stomach irritation and ulcers, and as a “stomach tonic” for intestinal diseases. They are also used for diarrhea, constipation, gallstones, gallbladder ailments, lower urinary tract and kidney disorders, fluid retention (dropsy or edema), gout, back and leg pain (sciatica), diabetes, high cholesterol, weight loss, high blood pressure, chest ailments, fever, increasing immune function during exhaustion, increasing blood flow in the limbs, increasing urine flow and quenching thirst. Seeds must be harvested before they reach full maturity. On our farm we mostly use the leaves. They can be dried or added fresh to dishes. 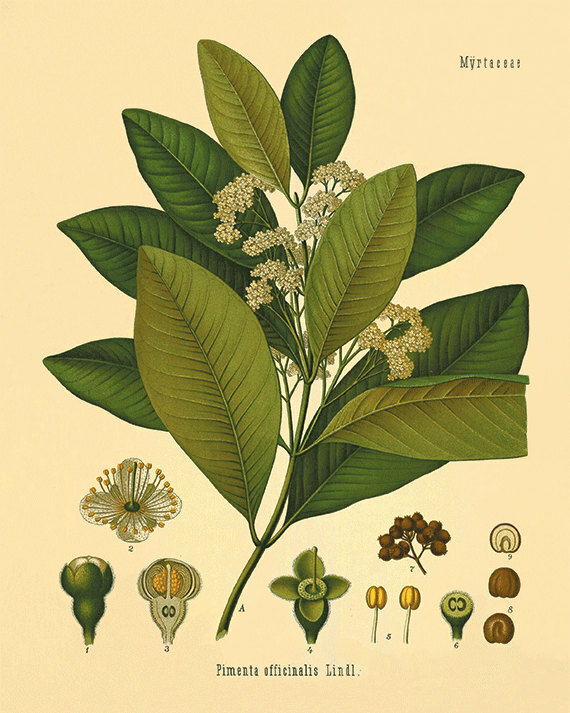 The oil from allspice seeds is used for toothaches and as a digestive aide. Fresh leaves are good for seasoning hot cider and some soups. Dandelions (Taraxacum officinale) are the scourge of many a lawn perfectionist, and everyone who ever had a front yard will recognize the barbed leaves and cherubic yellow flowers. But don’t wipe them out with herbicides, just eat them! Dandelion leaves are a perfect, gourmet salad green when tossed with a light vinaigrette, and are packed with vitamin A, vitamin C, and beta carotene. Parsley has been used as a source of certain vitamins and minerals. Parsley seed was used traditionally as a carminative to decrease flatulence and colic pain. 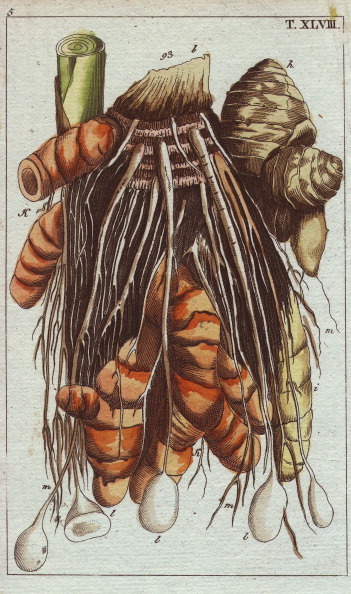 The root was used as a diuretic and the juice to treat kidney ailments. Parsley oil also has been used to regulate menstrual flow in the treatment of amenorrhea and dysmenorrhea, and is purported to be an abortive. 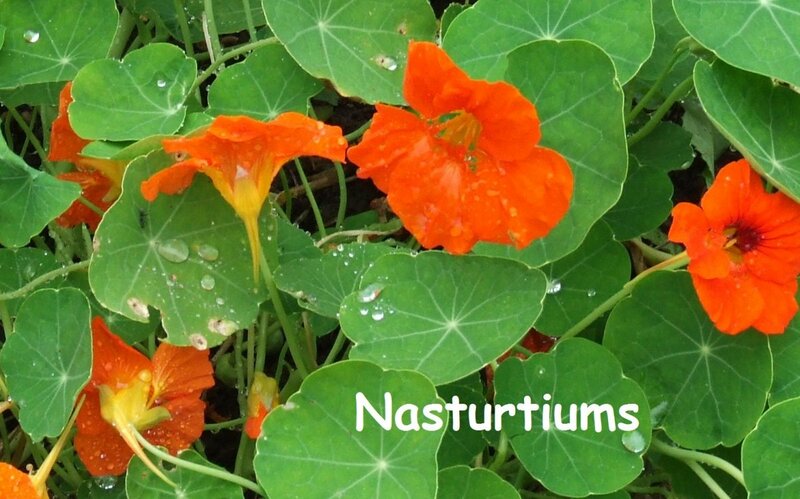 Bruised leaves have been used to treat tumors, insect bites, lice, skin parasites, and contusions. 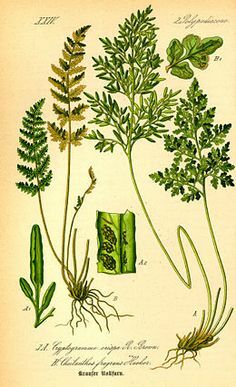 At one time, parsley tea was used to treat dysentery and gallstones. Other reported traditional uses include treatment of diseases of the prostate, liver, and spleen. Historically, parsley also has been used in the treatment of anemia, arthritis, and cancers, as an expectorant, antimicrobial, aphrodisiac, hypotensive, diuretic, and laxative. 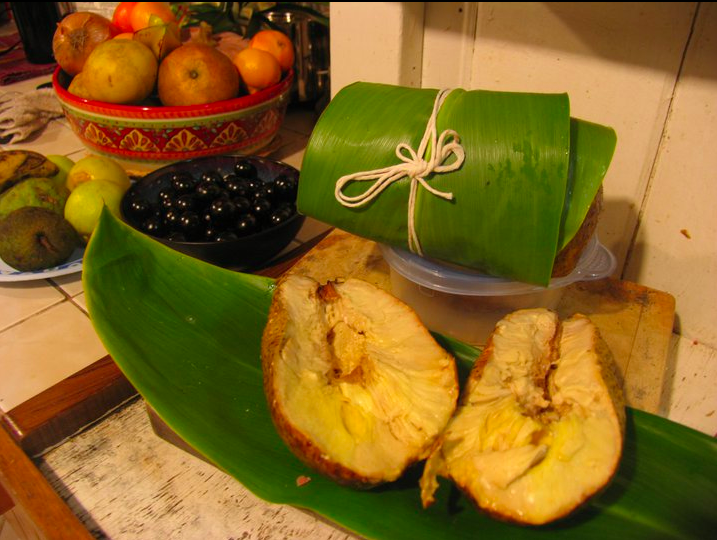 Popular in the Philippines, the leaves and seed pods of this amazing tree are edible, and healthful. Raw, the leaves have a lemony, peppery flavor. Cooked, they taste similar to spinach. Click on the links below to learn more. These sunny, wonderful little flowers originated in South America and were widely used by the Meso-Americans for urinary tract infections, kidney problems and for their general antibiotic action. 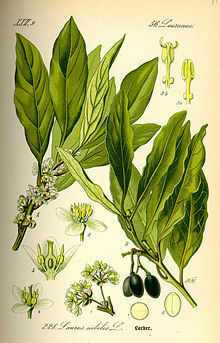 The leaves were used to prevent scurvy and to supplement the daily diet and add flavor. The peppery leaves were very popular and the seeds were a prized delicacy. Curry leaves are natural flav ouring agents with a number of important health benefits, which makes your food both healthy and tasty along with pleasing aroma. They contain various antioxidant properties and have the ability to control diarrhea, gastrointestinal problems such as indigestion, excessive acid secretion, peptic ulcers, dysentery, diabetes and an unhealthy cholesterol balance. They are also believed to have cancer fighting properties and are known to help protect the liver. And for those seeking to treat diabetes, the antioxidants provided by bay leaves aid in the absorption of insulin, which can have a powerful overall health effect. Although this plant may not count as a spice or an herb, I am including it here because it is loaded with vitamins and minerals and also, it tastes good. Plantain (Plantago major, white man’s foot) is another one of those plants that seems to thrive right on the edge of gardens and driveways, but it’s also edible. Pick the green, rippled leaves and leave the tall flower stems. Blanch the leaves and sauté with some butter and garlic just as you would with kale or any other tough green. Garlic grass (Allium vineale or wild garlic) is an herbal treat often found lurking in fields, pastures, forests and disturbed soil. 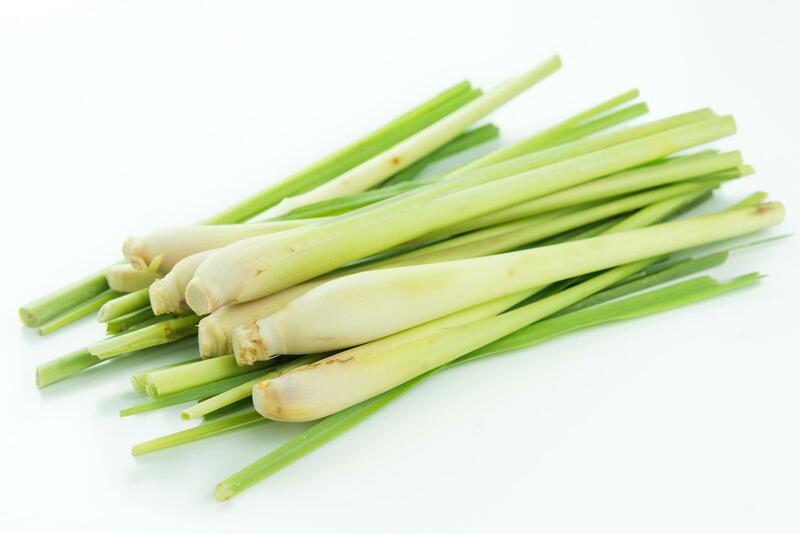 It resembles cultivated garlic or spring onions, but the shoots are often very thin. Use it in sandwiches, salads, SOUP, pesto or chopped on main courses like scallions. … Drinking lemongrass tea or eating foods prepared with the herb promotes digestion and provides relief from flatulence. It also helps the body eliminate toxic substances including cleansing of the kidney, pancreas, liver and bladder. Although I cannot definitively prove it, I believe I may have been an unwitting participant in an assisted suicide. Of our dog Milo. Milo was a runner. As in runner away. 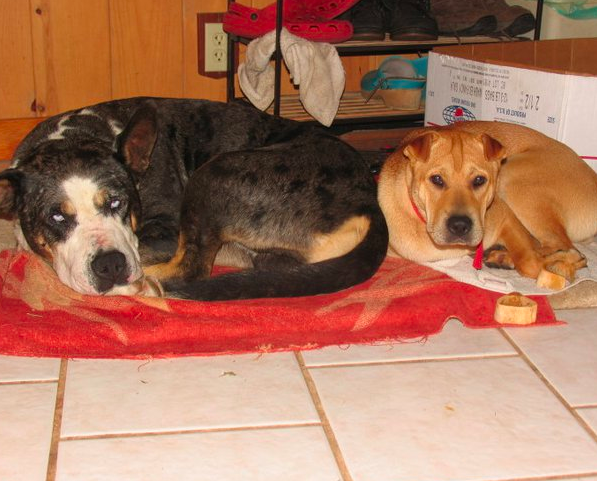 She was also very aggressive toward other dogs unless the dog also happened to live with us. So one night Milo escaped, only this time it was to her certain, though not immediate, demise. She went to a neighbor’s farm with lots of dogs, where the feeling of dislike was mutual. Our friend and tenant Juli caught up with her within a couple of minutes, but by that time it was already too late. Milo was in a brawl of epic proportions. I first became aware that something very bad had happened while cooking dinner. A vehicle on our private road was honking hysterically, as if someone had been hit and seriously injured or killed. Then I realized the sound was moving into and continuing on, in our lower driveway. Wiping my hands, I ran down in the dark, no flashlight necessary as my feet knew every inch of ground. There, I was greeted by an awful scene. 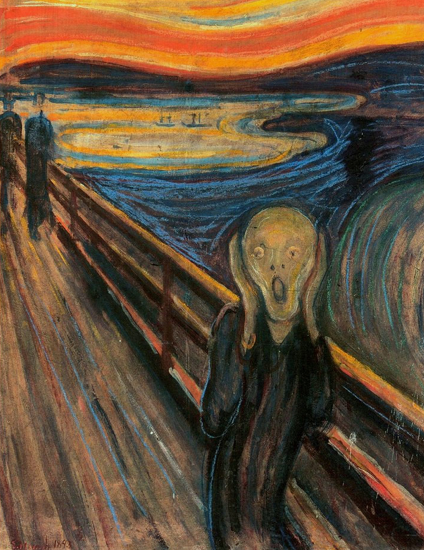 My husband was already there, as I came ‘round to the driver’s side, to cursing, arguing, and wailing. Peering into the vehicle, I saw small dog covered in blood, on a towel on a neighbor’s lap on the passenger side. This was not the first time Milo had run away, but it would be the last. With no love lost with our neighbors, I knew this was the end. I saw the handwriting on the wall. What Juli said later was, that the neighbors had come running just as she was breaking up the fight, screaming and cursing for her to get off the property while filming and photographing what was going on. As fast as she could, Juli had gotten Milo on a leash and headed back to our farm. Meanwhile the neighbors had jumped into their vehicle, pulling along side her, continuing to yell, trying to run her off the road. When they reached the boundary of our property, Juli fled with Milo into the land, whereupon the neighbors began honking nonstop, and came into our driveway. To be fair, we do not like these neighbors for a long standing list of reasons. And to be fair, they do not like us. From what we gathered though, no one actually saw who started the fight; their two dogs or Milo. She was running up the mountain, but they had no gates, and all of the dogs had a long-standing feud, so whether the row began on the road or on their property I cannot say. I also know that like getting a divorce or being fired from a job, when it comes to ending the life of a pet who has been with a family for years, no matter the reason, no matter the fault, it ends badly. Back inside Little House that last night, Milo wagged her tail and gave me her paw, as if to say, I’m sorry. But I would not accept her overture. James and I sat at the table, crestfallen and tearful. Though we were inside, safe and sound, it was already too late to change course. Instead I must brace myself to accept Milo’s fate, in which I must be a participant. She, on the other hand, seemed at peace. We had two more walks. Milo was uncooperative, as usual. It seemed for our final circuit we must tarry and I must urge and then finally drag her along our route. This had been the case ever since she had lost her freedom for good and forever; the freedom she had during the first year-and-a-half she lived with us, to roam at will up and down our mountain, across the coffee-land, with her –and my– beloved companion, the inimitable dog king of the neighborhood, Rascal. They had had the run of the place until Rascal died from a pig fight, and we had gotten a new dog, Shep. The trouble was, Milo was a wonderful sidekick, but not a leader. With Rascal gone, we started to get signs and complaints. Shep came home nearly scalped one night, with a machete wound to the head. Then one neighbor and another, and yet another said they would shoot our dogs, if they came on their property again. Despite being under the tutelage of Rascal, Milo had neither the personality nor the desire, to be anything other than a loyal despot to her pack. So it was, that she began her confinement, which lasted for the remainder of her years with us. 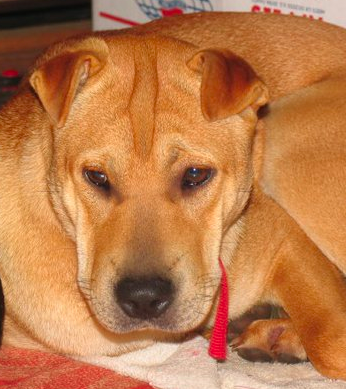 Milo could be in the house, on fenced decking, on a cable or chain, or in her kennel. She never could run freely again. We tried, but inevitably she would make her escape, more often that I was comfortable admitting, and get into trouble. The early days were the worst. Milo cried and howled morning, noon and night. I wished we had never gotten her both because of what she was now doing to my sanity, and what I had now been forced to do to her. Eventually she seemed to accept her fate, only to rebel again, and then again. If we tried to play with her outside, or she managed to slip out of her collar, or out the front door if it was left open even for a moment, she would disappear, refusing to come when we called. Walks were interminable, yet we must do them four times a day because we had no secure fencing, which would present a whole host of other problems, not to mention great expense. including other of our dogs and even another neighbor’s dog who they said was ours– had complained again. They probably showed footage and photos. Or threatened to. We never did hear about their dog, whether it lived or died, if there was a vet bill, or if the wounds which were dramatic looking might have been just superficial, although we asked, twice, in person for them to let us know. The other day, as I was working below the road that divides the neighbors’ farm from ours, one of them drove by. She saw me and smiled. Not a friendly smile, but more of a smirk. More of a sly, triumphant grin, as I labored with our woofers,* with our other dog, Duke, securely tied to a tree, catching the rays, as the shadows of the branches fluttered in the grass. I am gradually making peace with what happened. Milo was miserable. For years. And she was aggressive with dogs who were not part of her pack. When we left her at the Humane Society, she was calm, staring straight ahead as if she was already embracing the future. She did not look at us as we walked away. We were “pau” –severed, the rope cut, as they say in Hawaii. And I had helped her get to where she was going, without even realizing that it had all been arranged a long time ago, by an accident of birth, temperment, timing, ignorance and luck, that had finally played itself out, and settled in her favor, allowing her to be free of the confinement of an unfortunate combination of her personality traits and what can be the harsh reality of farm life in Hawaii. Either Milo was going to another home here, or to the great beyond, where all dogs eventually go, to heaven. 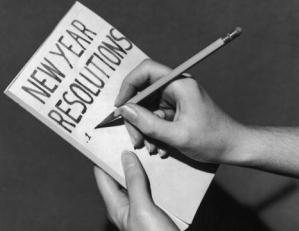 As we are often running late at Little House, it is absolutely time to post New Year’s Resolutions, before the month of January runs out. This past December it came to me again, that I must stop eating commercial chicken. That is one of my resolutions. Only free range, organic chicken is being se rved at the table. Even if it costs four times the price. Even if it is mostly diluted, cut in bits and pieces, added to soup and hash. We live a blessed life, despite heartache, disappointment and suffering that does come our way. There is plenty of good food, rain water, soft beds in snug homes, company and greenery here. We have enough and then some. So who is there to step up and do the right thing, if not us, who mostly live a charmed life? Thus the relinquishment of tortured industrially farmed chicken meat. Here is hoping you enjoy it as much as I continue to, looking ahead and wondering what the year will bring, and how it will look if I read it again next January. The source is cited at the end of the list. 1. Let go of all thoughts that don’t make you feel empowered and strong. 2. Let go of feeling guilty for doing what you truly want to do. 3. Let go of the fear of the unknown; take one small step and watch the path reveal itself. 4. Let go of regrets; at one point in your life, that “whatever” was exactly what you wanted. 5. Let go of worrying; worrying is like praying for what you don’t want. 6. Let go of blaming anyone for anything; be accountable for your own life. If you don’t like something, you have two choices, accept it or change it. 7. Let go of thinking you are damaged; you matter, and the world needs you just as you are. 8. Let go of thinking your dreams are not important; always follow your heart. 9. Let go of being the “go-to person” for everyone, all the time; stop blowing yourself off and take care of yourself first … because you matter. 10. Let go of thinking everyone else is happier, more successful or better off than you. You are right where you need to be. Your journey is unfolding perfectly for you. 11. Let go of thinking there’s a right and wrong way to do things or to see the world. Enjoy the contrast and celebrate the diversity and richness of life. 12. Let go of cheating on your future with your past. It’s time to move on and tell a new story. 13. Let go of thinking you are not where you should be. You are right where you need to be to get to where you want to go, so start asking yourself where you want to go. 14. Let go of anger toward ex lovers and family. We all deserve happiness and love; just because it is over doesn’t mean the love was wrong. 15. Let go of the need to do more and be more; for today, you’ve done the best you can, and that’s enough. 16. Let go of thinking you have to know how to make it happen; we learn the way on the way. 17. Let go of your money woes — make a plan to pay off debt and focus on your abundance. 18. Let go of trying to save or change people. Everyone has her own path, and the best thing you can do is work on yourself and stop focusing on others. 19. Let go of trying to fit in and be accepted by everyone. Your uniqueness is what makes you outstanding. 20. Let go of self-hate. You are not the shape of your body or the number on the scale. Who you are matters, and the world needs you as you are. Celebrate you! About once a year, unexpectedly and usually when I revisit a place I once lived, I have a spontaneous, totally unplanned most wonderful day of the year. This time, it happened quite early, when I was visiting my daughter on the Mainland over New Year’s. 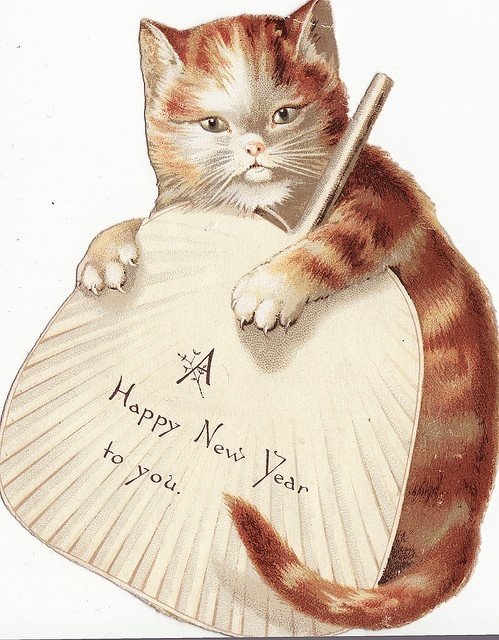 To begin with, as it turns out, New Year’s is much less stressful than most major holidays. There are no gifts. Decorating is optional. And the only way I go anywhere, is if I am spending the night, to avoid being hit by a drunk driver or shot at by revelers. As it happened a couple of days into January, the weather was cool and clear. We were staying with my sister and her family and a bunch of us managed to organize ourselves by mid afternoon to go for a hike. Two friends joined us. Plus a dog. We could see for miles. Plus we stopped at a wonderful coffee shop on the way, so we were fortified and raring to go when we hit the trail. After, I got to see a friend’s home for the first time, although she has lived there for many years. When we got back, my brother and his family were there, happening to drop by on their travels. He and his son stayed over night. They learned to draw and went early to bed. The rest of us ate dinner at midnight and played Boggle into the wee hours, laughing our fool heads off at my sister’s antics, which as always, were absolutely outrageous, which once again just goes to prove how very much fun one can have with good food, good people, pencil and paper, and a board game. 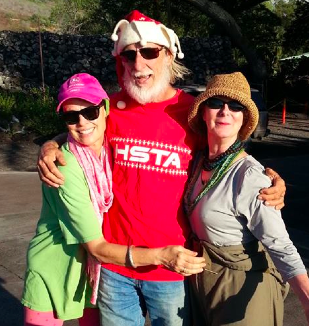 A few days later, I headed back to Little House, content and ready for the New Year to begin here in Hawaii. Granted, I have been resting and eating more since I got back, but then again, it is winter here, too, and the nights are still cool and the days brisk and sunny, so it is good for the time being to curl up and write, or perchance to read, and when I am good and done, I will be back outside, all the live the live long day, doing what farmers do best, which is to be working with and connected to the land. Holiday Season December 2014: snow in Hawai`i. Time to look back over the year gone by, and look forward in hope to the year to come. The date 12/13/14, the last one of its kind that most of us will see in our lives, reminds us that the year which is passing also will not happen again. For us, 2014 was kind of a routine year. After some years of struggle with legal battles, farm messes, daily life filled with the current emergency, we saw things slow down a bit, giving us a little more time to enjoy the flowers. We didn’t do any big travels, didn’t have a flurry of family visits, didn’t have any major catastrophes. Whew! Finally! 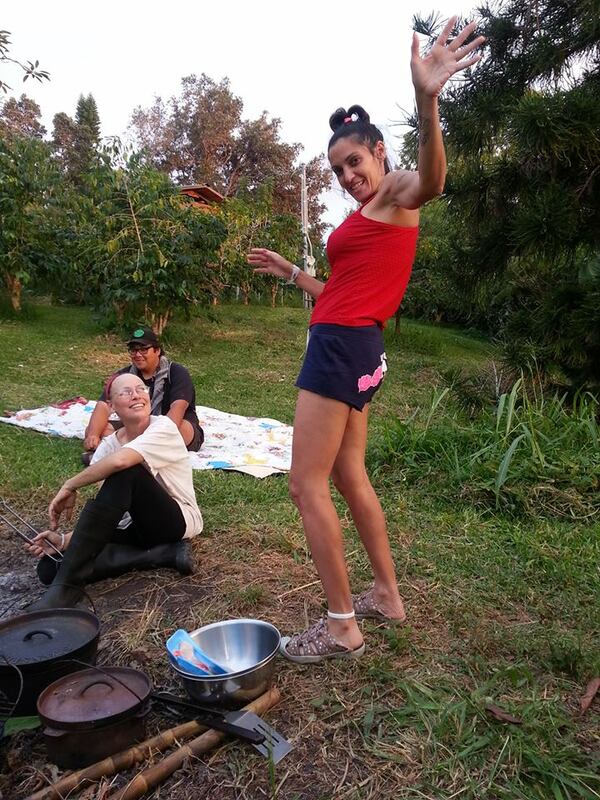 We did continue to grow; moving further with establishing our community of residents and helpers, producing tons of good food, and continuing to work in education, both in and out of school. Our new residents Vanya and Lola have settled in, and transformed the upper level of our packing house into a lovely apartment. Contractors repaired part of the roof, and James had help from wwoofers* to improve more of it. Trees which Sarah and I planted after our marriage have begun to give fruit. 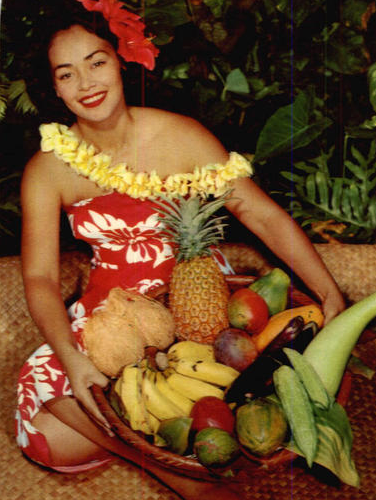 Sarah’s pineapples were amazing this year; so were the exotic greens she cares for. Avocados never stopped, and we had oranges or tangerines every month of the year. It is incredible how productive this land is; keeping up with the harvesting and distribution is quite the challenge. We are thankful for the bounty and the opportunity to share it. Our family / mainland friend visits were minimal in 2014. Tom and Nancy were on island visiting from New York, but due to time and circumstance we only met in town. Brother Aaron was on island for a couple of hours; he didn’t make it out of the airport. Keith was here from the Bay area, and he was actually able to visit us at home. Helps that his property here is a quarter mile away from us! The downside of this dearth of visits is that there are so many of you we wish we could see. James’ job situation improved greatly in November, with a return to teaching computer classes, his favorite venue in which to work. Instead of being ready to retire right now, there are thoughts of working another year. 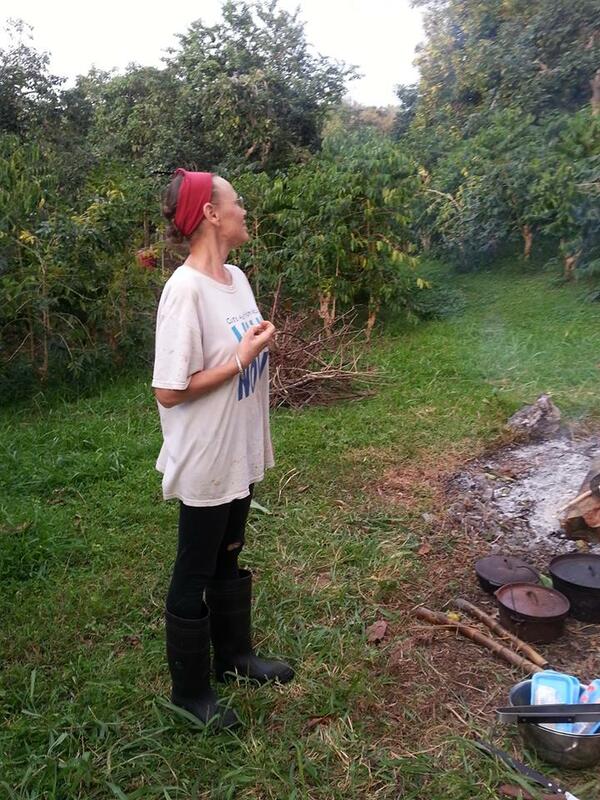 Sarah has been maintaining her farm blog (Little House on the Big Island) and has a retinue of readers. She is also doing much of the day to day management of the farm as well as working to ensure that all of our people are provided for. Daughter Christina is doing quite well in her Master in Fine Arts program at Yale. In addition to the distinction of being the first in the entire extended family to attend Yale, she is becoming quite the distinguished artist. 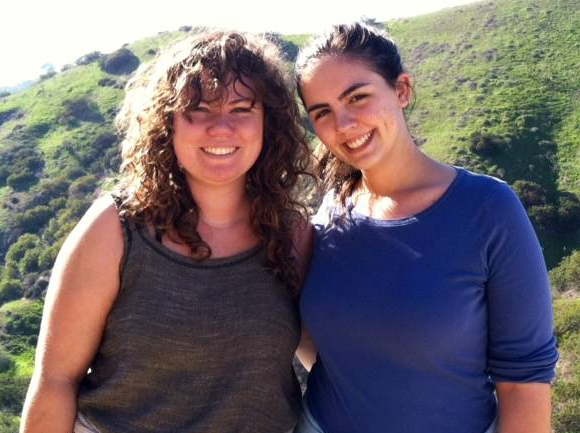 Northeast winters are not her favorite, but she and partner Alyssa are braving the climate quite well. They do like the down vests Sarah sent. We lost our dog Shep in July. 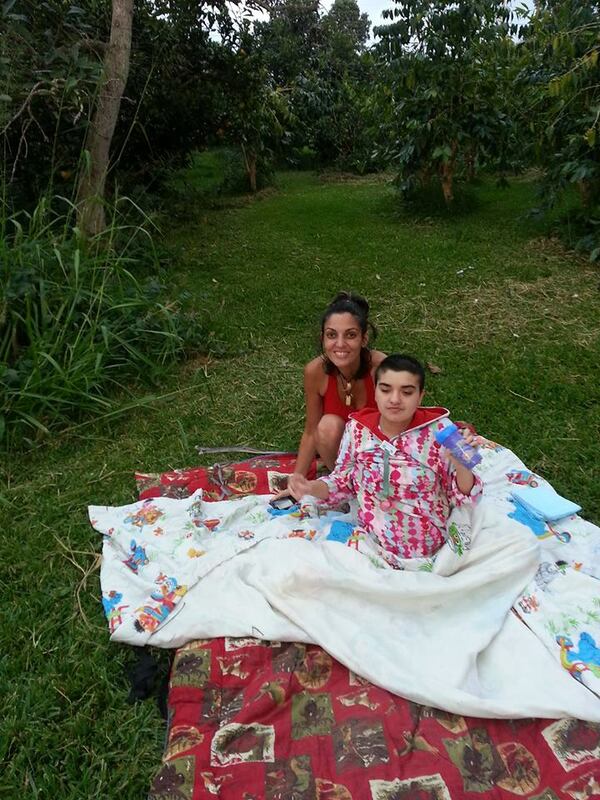 He had been having seizures every few weeks, but on this one day, the seizures started and continued in episodes until he died almost 20 hours afterward. That was probably our hardest day of the year. After a few months, we did adopt another dog, Duke, from the Humane Society. Milo is so happy she has a pal. We have been fortunate to maintain good health, though with the usual aches and pains. We have been saddened by some losses and illness among our family and friends. As with the cycle of planting, growth and harvest, these events are reminders of the temporary nature of our existence and the importance of making the most of every moment. We live here in this peaceful, bountiful place; we work very hard but otherwise could be considered among the most fortunate people on earth. We are so often saddened by news of conflict, violence, oppression, poverty and disease; it’s easy to consider this world a crazy place. For you who receive our thoughts, we hope and pray for health, love, peace and prosperity. We maintain the belief that if we live steadfastly in the light, we can help make the world a better place. In case you are reading this blog for the first time and didn’t already know, holidays, especially from late November through early January really, reall y stress me out. Indeed, if, like me, you were in the midst of holiday stress during this period, I can relate. How many times have all of us wished we were anywhere else, but trying to navigate the perfect storm that is the merriment and madness of relatives and celebrations? Say in some exotic local, like Hawaii. Actually not Hawaii, because that would be as far-fetched as imagining being on a cruise ship, with someone else in charge, doing all of, the cleaning and cooking and decorating, allowing for the perfect holiday, without having to have a meltdown to create it. The fact is, when you actually live in Hawaii, holidays are like they are anywhere else, with all the strife and work, except if you are an ‘ex-pat’ like me, the season is usually spent without old friends and family. Which can be both a curse and a blessing. 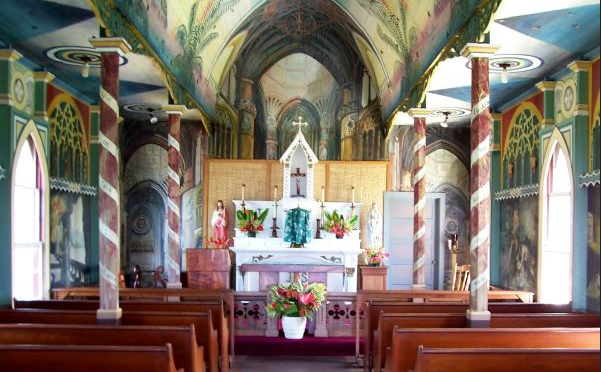 Although I visited the Big Island for five years when I was dating my husband, it never occurred to me until after we married, what the cost of being in Hawaii during the holidays would be. Take Christmas. Airfares here are to the moon. And don’t even think about renting a car unless you have booked it months in advance. Apparently everyone anywhere wants to spend the holidays here. Tickets are less, if they coincide with empty planes, returning at opportune times, but they still ain’t cheap. I happen to know this because I was recently on the internet day and night, checking fares, to see my daughter. My husband suggested we Skype instead. My daughter and me, that is. But if I took a last minute flight, he would not have been amused, if I offered to do the same with him while I was gone. To be fair, he would be stuck with managing the farm, plus a zillion dog walks, contending with the latest addition to our household, “Duke” from the Humane Society, who is allegedly a four-year-old boxer-mix, but who acts more like a year-old puppy and looks -according to a Google image search- more like he is part Great Dane, part hound… on New Year’s Eve. When fireworks are going off. None of this, though, was of any help to me, who had not seen my daughter in 14 months. Desperate to please everyone and not take responsibility, I did what any reasonable person would after looking up dozens of airfares and itineraries, to put off the inevitable. I consulted inspirational postings from friends on my Facebook page for insight and advice, instead of deciding one way or the other, whether to go or stay. Luckily, the answer came, almost immediately and the post was so good, I read it twice and then, reposed it twice. One of the most stressful times of year, for me, is a holiday. Any holiday. No matter how simple the plan, I want to hide under the blankets. Or sit on the toilet and cry. And now, life is jus t that much more complicated because instead of being with my most strange, unique, and special family of blood, marriage, other legal bonds, and a lifetime of love and friendship, I am living far away, on an island, in an ever-changing, self-created community on our farm of practical circumstances and also, of the heart. We did not have turkey. Or ham, or roast duck. We did not eat a single green vegetable. Or drink wine or beer. 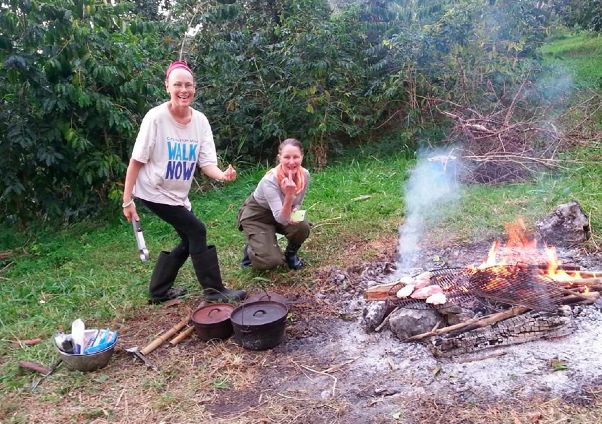 We did not cook anything on a stove or eat at a table. Instead, we dined on grilled chicken, island beef, and locally caught fish, with Dutch oven-roasted pumpkin and egg fruit, cranberry relish, beef stew, and challah, washed down with Coke, in the grass and on blankets around a fire, under the stars, by moonlight and smouldering coals that kept bursting into flame. 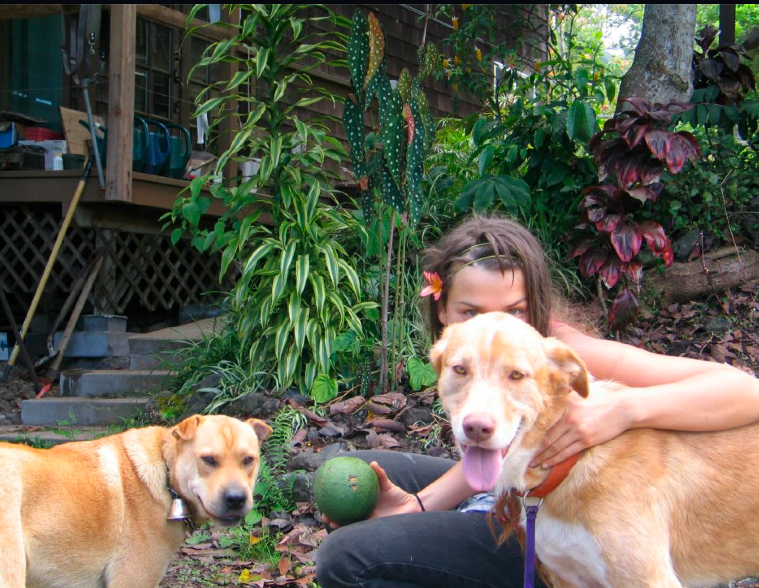 The dogs, jealous and outraged, serenaded us from their kennel, and all around the neighborhood we could hear the happy chatter of other languages, gunshots, and the laughter of children, running around their own cook fires, enjoying Thanksgiving, rural, Big Island, Hawaiian style. As for Little House, all was calm, all was bright. Dirty cast iron pots piled up, and bits of grass and leaves were strewn on the floor. As one of our woofers* carried the Dolphin back to her home, we gathered and put away leftovers. We poured the remainder of the stew into a giant bowl and covered it. The dogs were fed their due of meat scraps and chow. The cast iron got washed and set out to dry. My husband and I walked over to a neighbors to say hello and play a rousing game of Dictionary, and the night settled in, cool and caressing. At last, the dogs were walked one more time, in the cool, cool air that comes our way at this time of year. 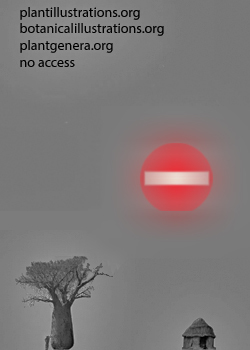 And everywhere, it became dark and quiet. And so we left the rest of the mess in the kitchen, with the coals shimmering outside, and tucked in, all of us, in our soft warm beds, and went to sleep for the night. And now I am quite certain of what I will at least try to do for Christmas eve. We will gather once again around a fire, weather permitting, and if I am lucky and blessed, there will once again be no silent tears in the bathroom, and crawling under the blankets will be late in the cool dark night, curled up with my beloved, resting soundly, and ready for what may come. * Workers on organic farms.